If you are familiar with Leo Tolstoy, you’ll know that his novels are massive and incorporate so much detail that it is rather difficult to break it down. As such, this is going to be a long review (fair warning!) so instead of telling you what I thought of the novel at the very end like I normally do, I’ll instead start with that, then go into the summary and analysis of the novel. Overall, I enjoyed this book for it’s whirlwind romance, it’s gorgeous descriptive vocabulary, and for it’s heartbreaking plot twists- but holy cow, did it take me forever to get through. At almost 1000 pages, with eight parts, and a whole lot of Russian names and phrases, and SO MUCH REDUNDANCY… I struggled a lot. But it is a classic novel for a reason, so though it’s a difficult read, there’s a real sense of accomplishment after reading it- at least that’s what I kept telling myself. Now, as I said, there are eight parts that follow the main and secondary love stories of the novel. Published in 1878, Russian writer Tolstoy created the tale of Anna Karenina and her love affair, as well as a secondary story line of Kostya Levin and his struggle with love and faith. These stories are intertwined at first, almost parallels, but the further you read, the more you realize that they are ones of opposition. Part 1: We are introduced to our main characters and their families. Countess Anna Karenina lives in Saint Petersburg and is the wife of government official Count Alexei Karenin. They have a young son named Sergei, but they call him Seryozha. When Anna’s brother, Prince Stiva Oblonsky, is found out about having an affair with the governess, Anna comes to visit him in Moscow to help him and his wife, Princess Dolly, as they reconcile. While on the train to Moscow, Anna meets Countess Vronskaya, who is well known in Moscow society. 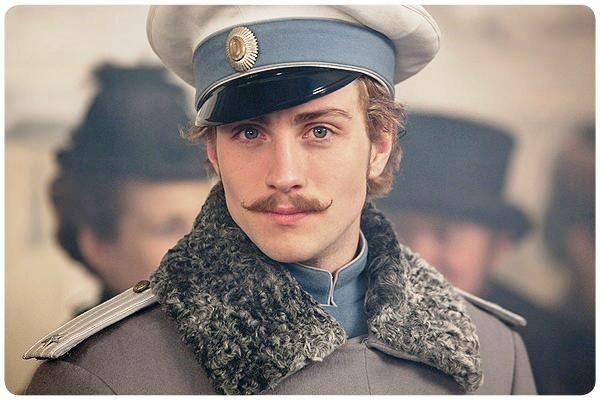 As their families greet them at the train station, Anna and Count Alexei Vronsky, Countess Vronskaya’s son and an army officer, meet for the first time and are immediately attracted to each other. Then, someone falls onto the railroad tracks and is struck dead by an incoming train. Anna takes this as a bad omen. At the Oblonsky’s, Anna and Dolly are visited by Dolly’s little sister, Princess Kitty. She’s eighteen and about to enter her first season as a debutante. Prince Stiva’s old friend, Kostya Levin, is also in town and planning to propose to Princess Kitty. He learns from Stiva that Count Vronsky is also pursuing Princess Kitty, but he doesn’t think Vronsky is serious nor a good fit for Kitty- though Dolly thinks that he is perfect for her sister. Vronsky is a well known, outgoing gentleman in society, and in comparison, Levin likes his quiet country-side estate- so in Dolly’s eyes, Vronsky would be the more impressive match. Undaunted, Levin proposes to Kitty…and he’s turned down, as Kitty expects Vronksy to make his move at her debutante ball. At the ball, Vronsky shocks all by choosing to dance with Anna, and it becomes clear to Kitty and the rest of the guests that Vronsky has fallen for Anna- a married woman. Unsure how handle the feelings she has for him, Anna immediately returns home to her husband, only to find that she’s fallen out of love with him. Part 2: Kitty is obviously heartbroken- not only has she been rejected by Vronsky for a married woman who is like family to her, but she also feels terrible for rejecting Levin, who had true feelings for her. Levin has taken his heartache back to the countryside, and when Stiva visits him, learns that he has taken to working in the fields. Anna starts to spend time with her new friend and socialite (who happens to be Vronsky’s cousin), Princess Betsy, in a way to be close with Vronsky without raising too much alarm. Often, she uses Betsy as an excuse for meeting Vronsky for secret trysts, and ends up discovering that she is carrying his child. However, the truth is revealed when they attend a steeplechase race that Vronsky was a participant in. He ends up in an accident that causes his horse, Frou Frou, (how awful is that name?!) to break her leg and having to be put down in front of the crowd, which causes Anna to be so upset about that it becomes clear (and a topic of gossip) that she has reciprocated Vronsky’s love for her. Part 3 & 4: Levin shares a lot of his spiritual ideologies and political thoughts in relation to agriculture in Russia, then decides to talk with Dolly about why Kitty declined his proposal. Dolly explains how it was more socially acceptable, angering Levin. He leaves her in a huff, determined to forget Kitty and marry someone else, only to catch a glimpse of Kitty and realize he’s still in love with her. Eventually, Stiva gets them to reconcile, and they finally get married. Anna and Vronsky decide not to hide their love for each other, and Karenin demands a divorce. However, the laws in Russia make it difficult to obtain one, and Stiva and Dolly try to persuade Karenin to change his mind. 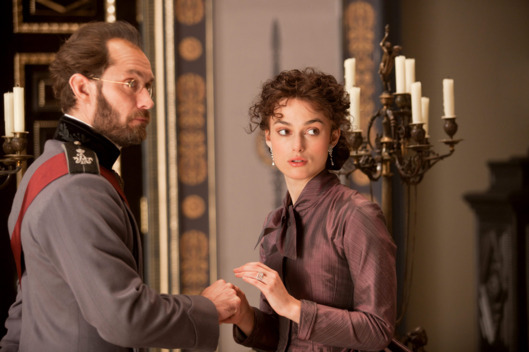 Then Anna becomes deathly ill following the birth of Vronsky’s child, Annie. At her beside, assumed to be her deathbed, she begs for forgiveness, and when Karenin does forgive, Vronsky cannot accept it- so he unsuccessfully attempts suicide. As he recovers, Anna miraculously does too- which leaves both men floundering. Desperate, she elopes with Vronsky, giving up her son, her social standing, and Karenin’s wish for a divorce. Part 5: Levin and Kitty have started their new married life, which takes some adjustment. Eventually, they learns that Levin’s brother Nikolai is dying, and go to his aid, where Kitty surprises Levin with her nursing skills, and eventually he finds out that Kitty is pregnant. Meanwhile, Vronsky and Anna struggle to find acceptance from their friends, and though Anna is content to just be with Vronsky, he starts to feel suffocated by her and becomes desperate for entertainment. Eventually, they both return to a hotel in St. Petersburg, and Vronsky is accepted back into society while Anna is not- so much so that when Anna attends a theater show, her old friends snub Anna for attending. Also ongoing, Karenin is keeping Anna away from her son, and telling Seryozha that Anna is dead, so Anna shows up uninvited to his birthday party, causing a scene. 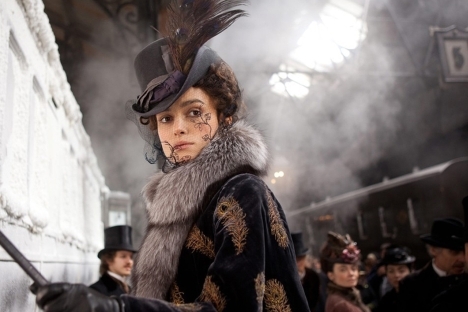 Not long after their return, Anna and Vronsky leave St. Petersburg and their old lives behind. Part 6: Kitty’s mother, Dolly, visits Levin and Kitty, along with Kitty’s siblings for the summer. Levin and Kitty have been living a simple, understated life, and in comparison to Anna and Vronsky, who have taken to extravagant spending for entertainment. A visitor named Veslovsky also visits, openly flirting with Kitty and angering Levin, who eventually kicks him out. Veslovsky moves into Anna’s, and Dolly notices that Anna flirts with him, as well as her anxious, desperate behavior. Anna is starting to unhinge, and is clinging to Vronsky, positive that she will lose him if they do not legally marry. Anna and Vronsky head back to Moscow. Part 7: Levin visits Stiva in Moscow for short period of time, and falls into the fast city pace, though he is uneasy about it. He ends up seduced by Anna, who is trying to prove that she is still attractive and make Vronsky jealous enough to fight for her devotion again. Levin admits his affair to Kitty, who eventually forgives him. Anna however, is unsuccessful in her mission, and ends up spiraling out of control. She becomes a morphine addict, abusive and jealous towards Vronksy, and eventually suicidal. She eventually recalls the death on the train tracks the day she met Vronsky, and decides to do the same by throwing herself in front of a passing train. Part 8: Vronsky turns suicidal after Anna’s death, and joins a Russian voluntary military group, and Karenin takes custody of Annie. Levin has accepted the love for his new son, as well as renewed his faith, but disappointed that this renewal didn’t make him a faultless human. Eventually, he concludes that as a human, he will continue to make mistakes, and that is genuinely acceptable. PHEW! So after all that, why is it a classic? Tolstoy’s writing is unquestioningly beyond the times and yet still relateable to his audience no matter the time period. A whirlwind affair, a nasty divorce, a man questioning his spirituality, a woman questioning her mental state… these concepts are universal, and yet topics that are usually left for more private conversation than a bestselling novel in 1880’s. The touch of Tolstoy’s poetic style left a classic that made an international impact for generations. Agreed!! I tend to get so hung up when I have to decipher meaning from the older diction, so I knew this would be the most challenging out of the monthly stack, but I’m glad I stuck with it!